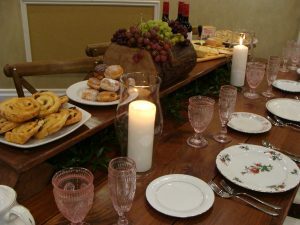 Tablescape and Decor Essentials – Party Supply Co. Need a Box, Mailbox, Chest or Card Container? 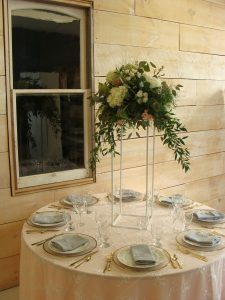 Table and Decor Essentials are a unique set of extra “one of a kind” items we think you will love. Thank you for joining us! 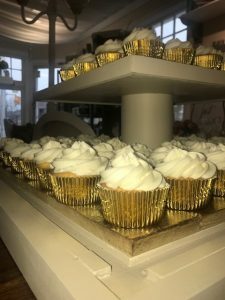 Scroll down to see listed items!! 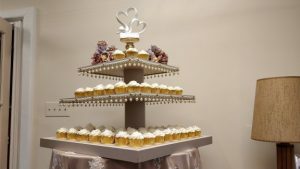 3 Tier Donut, Cupcake, Cookie or Sweets and Treats Pearl Tower. Neutral colors with gold and pearl accents. $45. Impressive one of a kind and in the new square format! “end wedges” at a seedling, circa 1620-1650 when the Knights Templar sailed the seas. $ 15. Here it is…A Presentation Block $10. 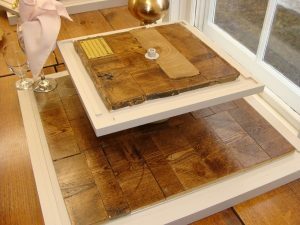 of this historic wood from above noted ash tree. 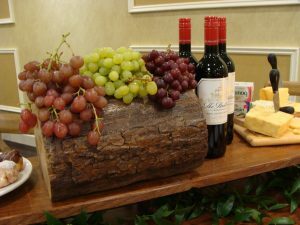 your fav item on your Presentation Plank. $15. 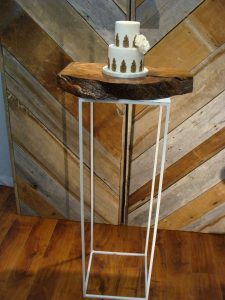 More live edge historic ash wood in a modern 2 Tier 17 CENTURY Ancient Ash Wood Tower for your tasty food items, sweets and treats like donuts, cookies, cup cakes, or any other favorites. $32. It’s here……our NEW golden/brass 3 tier tower for presentation of your favourite treats and sweets. $65. A one of a kind statement piece. 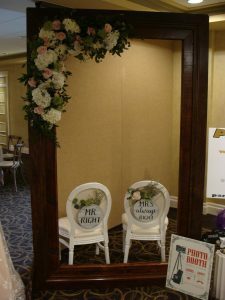 Photo Frame (does not include flowers or chairs) $150. plus delivery, set up and pick up in Stratford $30. Comes with 1/2 dozen props for fun photography opportunities or bring your own props and get creative. After all smiles is what it’s all about for your family and friends. Capture them on this special day!!! 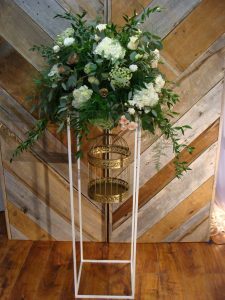 One of a kind idea and fresh for your wedding. Includes a low step up bench for a complete picture of your family and friend photos. 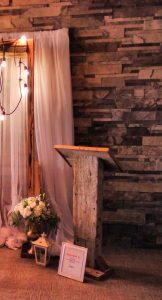 200 Year Old Douglas Fir trimmed Barn Beam Podium $48. 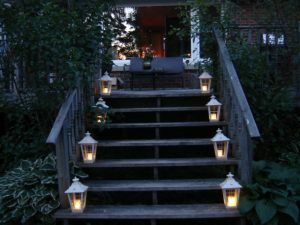 Lanterns come in 3 sizes from short to tall. Luminaries short 14″ (shown) $7. 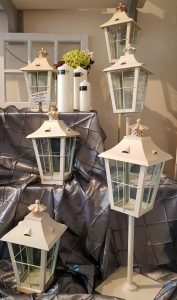 Coach House Lantern med 24″ $10. 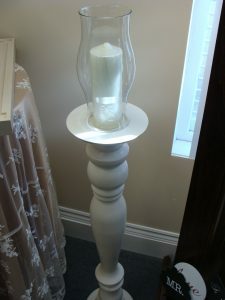 Coach House Lantern tall 35″ $12. 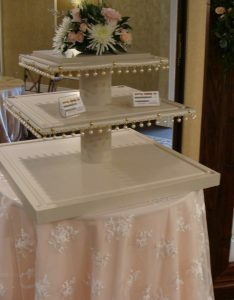 Choose from full size 35″ height to Luminaries to light your way to any special place at your event. 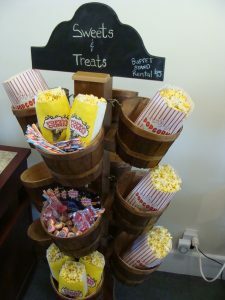 Sweets, Treats and Popcorn Rustic Buffet Stand $45. Up to 12 Early American Pine stained baskets are available and also as shown has a chalk board for your very own personal message. 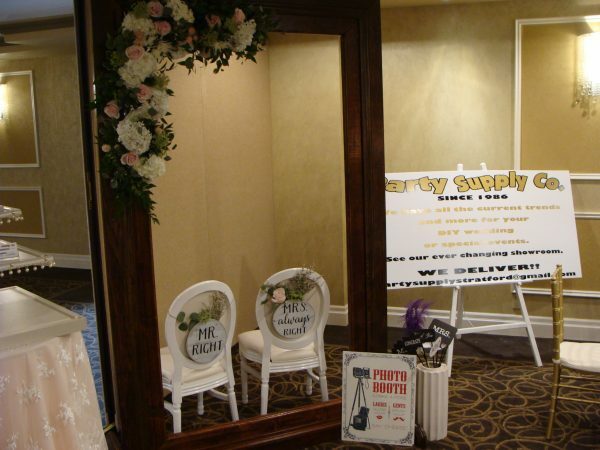 rent several Barrels to indicate a special reception or gathering area. 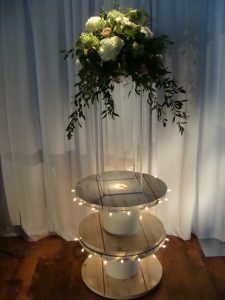 Rent 2 barrels and include our 8′ table top for a stand alone buffet table. 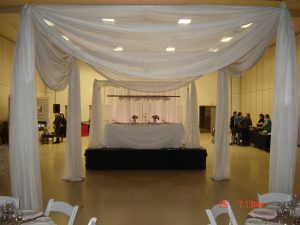 Elegant and Simple Sheer Drapery Backdrop with vertical pole and horizontal rail. Rental $100. 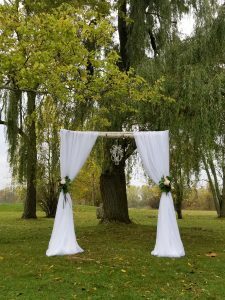 Includes easy snap and click stands, vertical pole, horizontal rod and sheer. Literally a 10 minute set up…. Same sheer with 4 bases, 4 vertical poles and horizontal rails to make an instant Dance Floor. $350. Just add the Edison lights for spectacular! Candle Sticks pair with Globes $ 40 pr. Quantity 1- 2 @ $17 ea. Quantity 3-8 $15 ea. Quantity 9-15 $13 ea. Quantity 16 plus $11 ea. 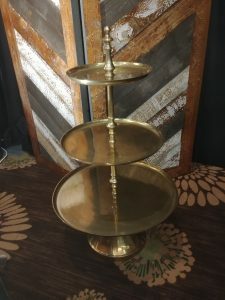 Wrought Iron Cruiser or items of interest Table Stands 48″ H X 14″X 14″ $22. ea.